URGENT: Letter-Writing Action: Stop Sweden’s Illegal Deportation of Kurdish Opposition Activist Fouad Velzi! Send this sample letter (adjust to your own taste) to stop the Swedish government’s illegal attempt to deport Kurdish Iranian opposition activist Fouad Velzi. After sending the letter, please also sign Fouad’s petition. It is very important to do both. Fouad Velzi is currently being held in detention by the government of Sweden with the intent to illegally deport him to the Islamic Republic of Iran. The Swedish government intends to return Fouad to detention, torture, and possible execution at the hands of a regime that has executed at least 37 people over the past 10 days. It is up to us to do all in our power to stop this crime. I am writing to you to demand an immediate halt to the illegal deportation of Fouad Velzi, a Kurdish Iranian asylum-seeker and opposition activist who has sought refuge in Sweden from persecution by the Islamic Republic of Iran. Fouad has a well-documented history of activism against the Islamic Republic. Fouad joined the Democratic Party of Iranian Kurdistan in his early years. As a member of its underground organization, he supported the logistics and supplies division for the Democratic Party’s armed units in the border areas with Iraqi Kurdistan until the date of his arrest. Fouad was arrested during the course of one of his assignments to bring supplies to the peshmarga forces who had bases around the Qandil area. He was detained for 2 days, tortured, mock-executed, and forced to sign a confession about his connection to “counterrevolutionary organizations and moharebin.” Fouad was ultimately released, and continued his activities, crossing the border on numerous occasions to meet with key members of the open peshmarga organization. Eventually, however, he learned he had been exposed; he fled for his life to Sweden, knowing what awaited him if he stayed in Iran. Anti-regime activists are usually charged with propagating against the regime and moharebeh, which carries the death sentence in Iran. The Islamic Republic considers all Iranian political asylum-seekers to be criminals, deeming their quest for asylum as propagating against the regime. The Islamic Republic has on several occasions declared and applied its intent to prosecute returned political asylum-seekers, on the basis of Article 7 of the Islamic Republic’s Penal Code. Rahim Rostami, a teenaged Kurdish asylum-seeker returned to Iran by Norway and immediately imprisoned is one such example. 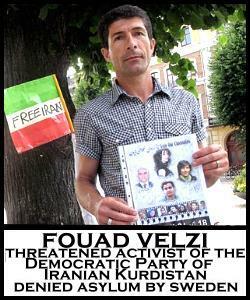 Fouad has sought political asylum and therefore, under the Islamic Republic, is subject to prosecution by the regime. It is illegal under international law for any country including Sweden to deport a person who has a legitimate fear of persecution in their home country. It is therefore undeniably illegal under international law for the Swedish government to participate in the crime of deporting Fouad Velzi to Iran, where he will be detained, tortured, and possibly executed if he is returned to the blood-soaked hands of the Islamic Republic. Yet despite this finding, the Swedish government continues to illegally attempt to deport Iranian activists like Navid Mirpourzadeh, Sanan Ashrafi, Marzieh Kamangar, Mehdi Maleki, Keivan Soufastaei, and others, all of whom are clearly and undeniably at risk not only of detention and torture by the Islamic Republic of Iran, but at unquestionable risk of execution. We demand an urgent, immediate halt to Sweden’s intended illegal refoulement of Fouad Velzi, who is at clear risk of execution if returned to the Islamic Republic. Given the the Migration Office’s blatant, repeated violations of international law regarding refugee rights, risking the lives of Iranian and other asylum-seekers, we demand that Sweden must not only immediately halt the illegal deportation of Fouad Velzi, but must immediately cease all deportations to Iran. « Tuesdays Until the Islamic Republic Is No More | سه‌ شنبه‌ها تا خود سرنگونی! Human rights weighs heavier than your economical interests mr Billström! Mr Velzi, be shoma eftekhar mikonim va yareh shoma hastim! Der Mann darf nicht verschoben werden. Sein Leben unter Islamik-Republick Iran ist im gefahr.